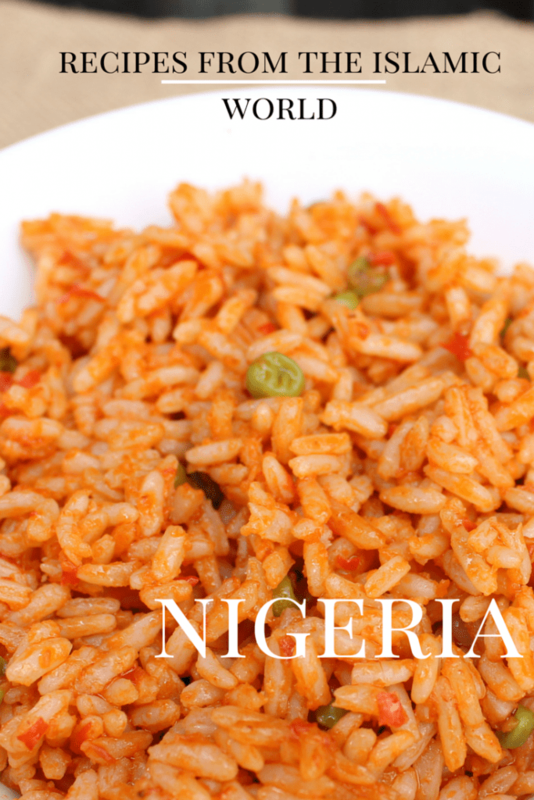 In today’s post we travel to Africa, Nigeria specifically, to enjoy a rice dish. Oddly enough rice isn’t big in Morocco though you’ll find all sorts of rice dishes around Africa and the Middle East. 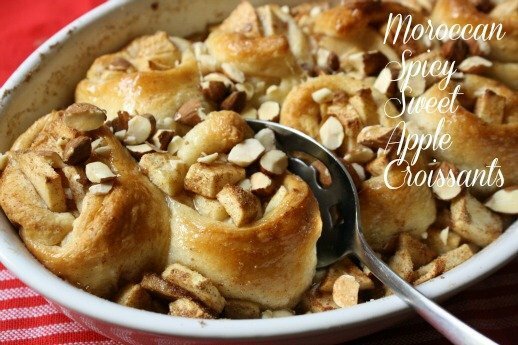 This recipe is from Sadaf who blogs at My Culinary Adventures where you can find some great recipes for Ramadan and beyond. 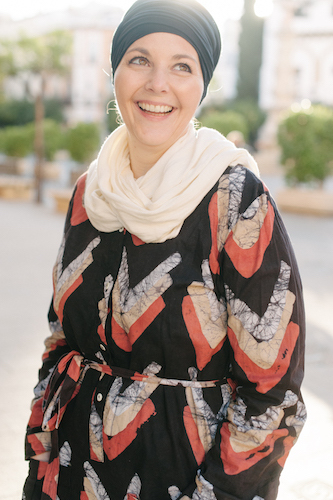 You can also connect with her on Facebook, Twitter, Instagram, and Pinterest. Enjoy! My in-laws are of Indian origin but spent nearly three decades of their lives in Nigeria before moving to the US around fifteen years ago. Like his brothers, my husband was born and brought up in Nigeria. During nine years of my marriage I have heard some fascinating tales of Nigerian culture and the wonderful times that they enjoyed there. It’s almost considered a feast in my house whenever Nigerian food is cooked. I remember the first time when my brother-in-law cooked Nigerian Beef Stew for all of us just a few days after my marriage. My husband, unaware of my adventurous taste buds asked me if I would be able to handle the fiery dish. To his surprise not only did I enjoy it along with pounded yam, it actually went on to become one of my favorite dishes over the years. Now whenever it’s cooked I can’t resist eating it for days in a row. 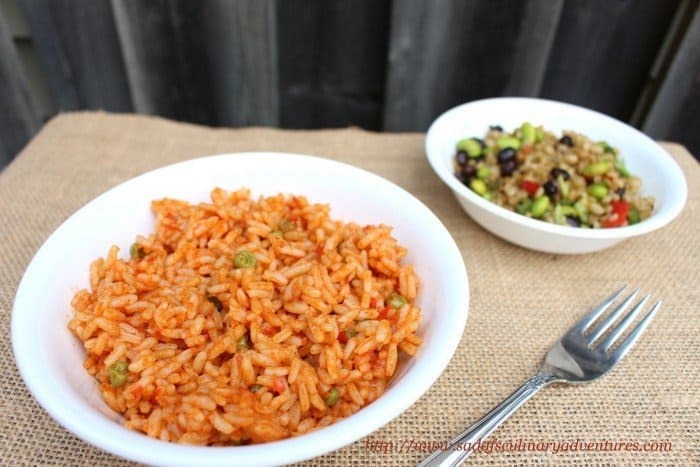 Jollof rice is another of my favorite Nigerian dishes that’s often cooked in my house. We like having it with grilled meat and stir-fried vegetables or salad. I believe there are many versions of Jollof rice that are popular all over West Africa. 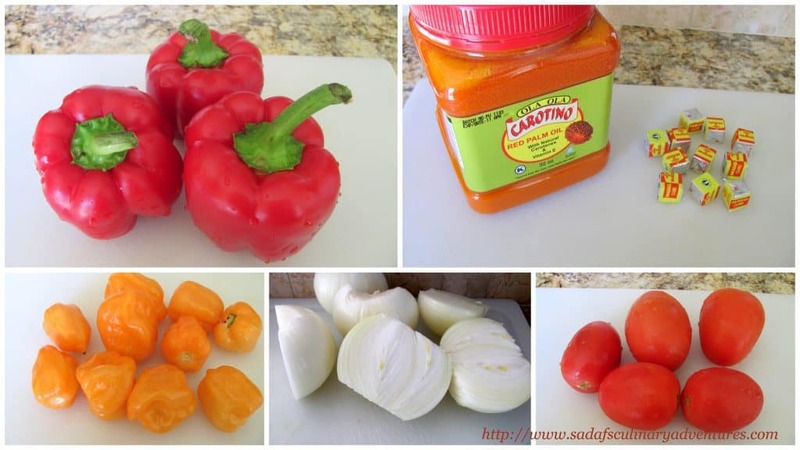 The version that we make at home is a basic one using red bell peppers, onions, tomatoes, tomato paste, scotch bonnet peppers/habanero peppers, Maggi cube seasoning and parboiled rice. I often add my own touches such as garlic, ginger and green peas. You can choose to skip the tomato paste and use more tomatoes instead or vice-versa. Traditionally, palm oil is used in Nigerian dishes but I often substitute it with canola oil for health reasons. All ingredients for this version of Jollof Rice can easily be found in major supermarkets, except for Maggi cubes and palm oil which are found in African grocery stores. A word of caution regarding scotch bonnet peppers – they are extremely HOT, so even a little goes a long way. In a blender blend together onion, red bell pepper, tomatoes, tomato paste, scotch bonnet pepper, garlic, ginger and Maggi cubes with just enough water to make a paste. Heat oil in a deep, heavy bottomed pan and add the blended mixture. Sauté the mixture on medium heat until it thickens and oil separates from it. Add drained rice and stir gently so that the sauce coats the rice. Add about 2.5 cups of water and bring it to a boil on medium heat. Taste the water to check seasoning. Add more Maggi cubes or salt if required. Keep stirring gently periodically so that rice does not stick to the bottom of the pan. When almost all the water is absorbed add frozen green peas. Stir gently, cover the pan and simmer on very low heat until rice is cooked. Fluff gently with a fork. Serve with grilled meat and vegetables or salad. I was in as soon as I saw the Scotch bonnets! We love, love, love spicy at our house. Thanks for sharing this tasty rice, Sadaf!